Over 60% of ice machine maintenance calls are water-related! 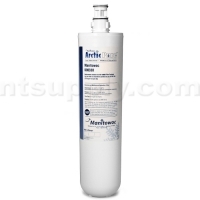 Arctic Pure water filters are designed exclusively for ice machine applications and will reduce these calls. Built-in scale inhibitor. Siliphos is designed into the filters to reduce scale build-up even under the hardest water conditions. Graded density carbon block filter. Provides superior dirt holding capacity and fine sediment reduction. Dimensions: 14-1/2" x 3-3/4" Dia.